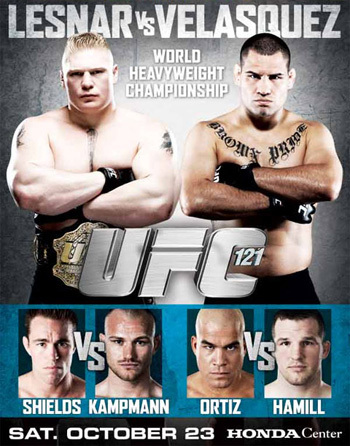 Anybody interested in finding out how to make the most anticipated MMA event of 2010 even more exciting? Well, the Gambling Gods have the latest betting lines for “UFC 121: Lesnar vs. Velasquez” just in case you are interested. As expected, Brock Lesnar will enter the Honda Center in Anaheim, California favored to retain his heavyweight crown against Cain Velasquez. Lesnar opened as high as a 2-to-1 favorite when he faced interim title holder Shane Carwin in his last outing at UFC 116, however their line was nearly a Pick ‘em by the time the cage door slammed shut. It will be interesting to see how the money moves as game time approaches. Despite coaching Matt Hamill in the third season of “The Ultimate Fighter,” Tito Oriz returns to the Octagon a slight underdog against his former protégé. Ortiz owns a respectable 15-7-1 record, however it can be argued the 35-year-old hasn’t won a significant scrap since taking a split decision over Vitor Belfort at UFC 51 back in February 2005.